We have done so many things to our heritage and history which we were not expected to do. We have distorted it, twisted it and have disrespected it. Realising what we have done is the least we can do now!! As one travels towards the JJ Flyover in South Mumbai from Byculla Bridge, a huge banner of a statue grabs your attention these days. A black and white photo of that statue and green colour cloth in the background tells you that a construction activity is in progress, on that junction, one of the busiest junctions in Mumbai. Last year, sometime in October, a representative of a well-known advertising company phoned Pankaj Joshi, an architect specialized in restoring heritage structure and executive director of Urban Design Research Institute (UDRI). “How did you manage to get the permission to put that banner there? We were told in the past that banners won’t be allowed so near to the road in that area. By the way, where have you kept that statue in the photograph anyway,” the person asked in partly surprised and partly suspicious tone. Pankaj, a bit surprised by the question initially, managed to control sarcasm and laughter in his answer. “It’s not an advertising banner, it’s just a cover. We are working on restoring the statue, which stands exactly behind the banner,” he said. “Ohh…that’s fine,” and the person on the other side cut the call, satisfied that he hadn’t lost the ‘prime spot’ of Mumbai to another advertising agency. Just like majority of others the poor guy from advertising agency wasn’t interested in what heritage structure stood behind the poster. The statue in discussion is one of the iconic statues of Mumbai, known as ‘Khada Parsi’ or ‘Standing Parsi’ in English. Sadly, despite being placed in one of the busiest junctions of the city, a majority of Mumbaikars have neglected this crucial piece of History and Heritage. Almost 40 feet tall and 150 year old cast iron structure and bronze statue of Shet Cursetjee Manockjee, was built in 1860s by his youngest son Manockjee Cursetjee, by spending almost a lakh of rupees then. Manockjee, known as a reformer in education sector, is responsible for founding one of the first schools for girls in Mumbai in 1863, now called Alexandra Girls English Institution, located in South Mumbai. The statue was built in parts, in London and the separate parts of it were brought to India via-sea route. The various parts were later assembled and then stood the Parsi. The Parsi community has made tremendous contributions in the development of Mumbai and this statue should have been treated with due respect, all over the years, as a mode of recognition to the contributions made by Parsi community. Sadly, just like majority of heritage structures in our country, the statue met with the similar fate. Before Brihanmumbai Municipal Corporation (BMC) decided to carry out a restoration of this iconic statue in October last year by spending almost Rs 1.2 crores, the statue had suffered tremendous damage. While corrosion of the metal due to massive pollution was one of the major reasons to worry, the metal used in the construction was a good gain for petty thieves on the roads of Mumbai. 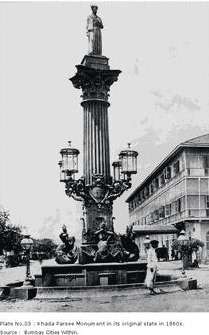 The lamps on the statue were stolen, parts of cast iron shaft were gone and the four mermaids on top of the fountain never looked so dreadful and robbed, after receiving a number of hammer shots from thieves to separate the iron parts. I forgot to mention, the genius road department of the BMC had built footpath almost a foot above the fountain, blocking the fountain. Being adjacent to flyover, the open space around the statue had become home for a family. Currently the same family has shifted to the neighbouring flyover. It was only after the constant pursuance from conservation activists, architects and citizens that the BMC decided to restore the old glory. Pankaj and his team are working on restoration of the statue since October. The entire process might take four-five months more. Interestingly, the statue has always helped people to meet their friends and relatives. During the era of mills in Mumbai, Khada Parsi had become the hot-spot for meeting. It was a known spot then and so popular that, stories say that, when a relative used to come to Mumbai to meet his family, he was told to come near Khada Parsi. The families used to wait near the statue, waiting their relatives to come and pick them up. They unanimously opposed the move to shift it from Byculla to any other place. Reason? Well, I really don’t know. It seems, their pride was hurt and they didn’t want the heritage of Byculla to move out. Sadly, the pride wasn’t hurt when the statue was in ruins. As I watched the photos of statue, from all angle, I saw a pipe like thing coming out from the head of statue. “What is that?” I asked. “That must be a thing used while assembling the loose parts,” said Pankaj. “You know what,” he continued, “The statue is 40 feet tall and it is not meant to be seen from closer site. See the texture, it’s not fine, but it’s rough. The makers wanted us to see it from down, but now the flyover passing so near to it, we can almost touch the head,” he said. Yeah, I thought. We have done so many things to our heritage and history which we were not expected to do. We have distorted it, twisted it and have disrespected it. Realising what we have done is the least we can do now! !